I’m not sure what made me buy this bag of candy. Perhaps it was my curiourity of how or why they would make a nice piece of yummy licorice into a sour candy. So, I opened up the bag and pulled out a handful. Interesting, looks like licorice but had all sorts of sugar on top (to add that extra punch you would soon have) and bold colors. Which one to try first?! I went with the green apple. It was a nice tart green apple, sneaks up on you at the end. Next up was the Cherry, it was not an overly strong cherry flavor but it did make my mouth water a bit. Could not stop there I had to try the blue raspberry, instant >pucker<, and a few extra swallows. To me, this was is the tartest. Last up, was the strawberry and I was not impressed with this one. The flavor was to *me* a bit off and not much tartness. The boys have tried them and are enjoying them ever so slowly. I don’t think they are a hit with them, if they were the bag would be gone by now. 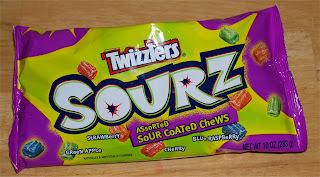 They are not super shockingly sour like many other candies out on the market. If you like to have a little bit of tartness then give them a try. 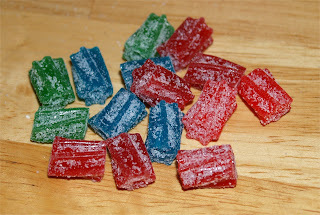 They are unique and fun to try but I’m not convinced that licorice should be sour.